Exclusive savings and helpful wood pellet tips delivered to your email inbox. 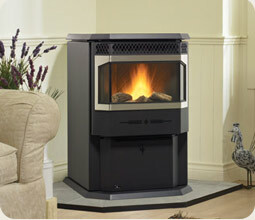 Wood pellet stoves are highly efficient, environmentally responsible, convenient and affordable – everything you want when keeping your family warm. Whether you’re looking for a stove to complement your décor or to bolster your budget – or both – the Wood Pellet Stove Finder can help you make an informed decision and find the wood pellet appliance that’s right for you. Reliable Wood Pellet Technology: Over 25 years of research and design has been invested in the Greenfire™ line of pellet stoves. The result is a quiet, inexpensive and efficient home heater that fits perfectly into your lifestyle. Traditionally styled with the highest quality and durable components; Greenfire products are built to last. Product engineers created a low maintenance, environmentally friendly, product that burns efficiently. The Greenfire GF55 and GFI55 have been tested and certified to the strictest clean air standards as set by the Environmental Protection Agency.